"So please, if you really DO care about not hurting creators, and you don't mean anyone associated with Platinum and working on their books ill will. Just shut up already. WE, collectively, as a group, all of us creators working for Platinum, DON'T WANT YOUR HELP, SYMPATHY, OR LOUD MOUTHS running off on your blogs, and columns any more about this crap. You're NOT helping us, like some may think, you're NOT looking out for us, and you're definitely NOT making any friends among us, by spouting all the vile, political, petty nonsense that you've been going on and on about for a while now. I can assure you that if you were in my position, coloring and painting all day, making a living doing that, you would have NO complaints about anything, so long as your money kept coming in." 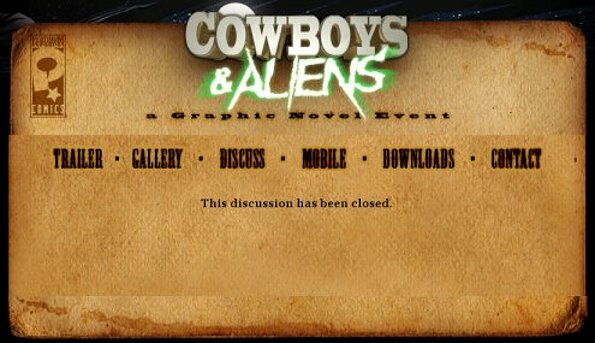 Screen capture of the discussion page from the Cowboys & Aliens website. This is the graphic novel that Midtown says they sold the most of that week — and I believe them, because that means very little, in fact. The 112-page yarn was marked down from $4.99 to $.75 in many stores. Think of it this way: If the cashier charged each customer an extra penny and shoved a "graphic novel" in their bag, how easy would it be for that book, even if it was a compilation of infant shitstains, to be the best-selling item that week? It's simple, it's sneaky, and it's, sadly, legit. Worse, it's practically what C&A did with, admittedly, a slightly higher price-point and (somewhat) better content. Platinum Comics Studios took a playbook from the '90s spectator market, delivered a shiny product with a high page-count and a low — rather, a "reduced" — cover price, and foisted it upon the masses. Noting this, I asked for comment from ¡Journalista! readers who'd seen similar retail giveaways or markdowns, or otherwise knew more about the circumstances behind how this book reached comics-shop shelves. Monday's call for information revealed that at least one store, the aforementioned Midtown Comics, has indeed been giving away copies of the book in question to its customers. Further, I've received secondhand reports that the New England Comics chain of stores in Boston, MA has been selling copies of Cowboys & Aliens for the staggering sum of 75¢, and that (according to one source) "managers who had never ordered the product had it foisted upon them by the central office, who also told them to push it hard." Again, this is second-hand hearsay, so take it with the appropriate grains of salt. Was something underhanded going on? Well, at the moment, the answer appears to be "no and maybe." So far as the Entertainment Weekly angle is concerned, there seems to be less to this story than meets the eye; a call to the person handling Midtown Comics' promotions efforts, Jerry Gladston, quickly put things in a different perspective. 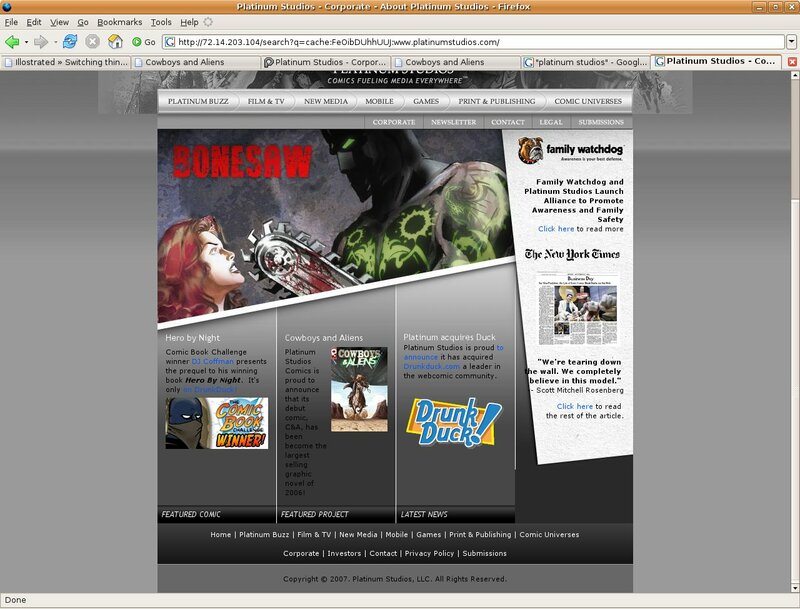 Screen capture from Midtown Comics' online listing for Cowboys & Aliens. According to Gladston, Entertainment Weekly never actually contacted the store about its sales numbers for the week in question; rather, he believes that they went to the top-25 listing on the store's website and pulled the numbers from there. The current listings are now different, of course, but as you can can see from the listing for Cowboys & Aliens reproduced above, it's clearly marked as a free giveaway. Gladston speculates that whoever at Entertainment Weekly pulled the list from their website failed to notice this caveat. (Likewise, there's a similar caveat to the store's online entry for Marvel Comics' Dark Tower Gunslinger Born Sketchbook, also listed as a free giveaway yet, like Cowboys & Aliens, uncritically included in the magazine's top-ten comics list). Entertainment Weekly has not returned my request for information as of press time. Gladston also confirmed that Midtown Comics ordered the books through Diamond, and was later reimbursed for the cost of ordering the books by Platinum (plus a bit extra to cover shipping, handling and administrative costs). As to the larger question of whether Platinum is using this gimmick to drive the impression of its debut graphic novel as a "bestseller," Gladston refused to speculate — seen from his perspective at the retail level, it's a straightforward promotional giveaway, and there's no indication that Midtown Comics has ever represented it as anything else. "I'll take any opportunity to give away free comics," Gladston told me. Whether Platinum Studios had cultivated plans to represent all this as something else — well, that's another question altogether. To answer it, I put in a call to Platinum and eventually found myself talking to the company's president and chief operating officer, Brian Altounian. After he likewise stated that Platinum had no contact with Entertainment Weekly regarding their erroneous sales chart, I asked Altounian directly: Did Platinum Studios compensate retailers for books ordered with the intention of turning around and proclaiming the book to be a bestselling graphic novel? Confused by his explanation of how this marketing campaign worked, I pressed further: If there was no direct quid pro quo between monies offered and books purchased, were there any controls placed upon how retailers could spend the cash issued to them by Platinum? "None," Altounian replied. So was there anything keeping retailers from spending the money on, say, new cars rather than promoting Cowboys & Aliens in their shops? Again, Altounian replied in the negative, before adding that he couldn't imagine why retailers would do such a thing. Platinum, he reaffirmed, didn't tell retailers how to use the "marketing dollars" provided them. Screen capture from the Google cache of Platinum Studios' homepage, with relevant text highlighted for clarity — thanks to T. Campbell for the link. Platinum's website currently makes no claim as to the sales success of its debut book... but it did in the recent past. Above is a detail from a screen capture of the Platinum homepage, taken from the Google cache of said page yesterday at 3PM Mountain Standard Time. (Due to the dark-text-on-dark-background design of the page in question, I've highlighted the relevant text — a larger, unaltered 214k image file of the original capture can be found at this link.) 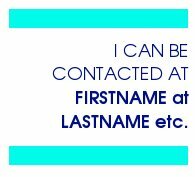 I read the highlighted text to Altounian and asked him why it had appeared on his company's homepage. Altounian responded by noting that the company had a wide and ambitious variety of plans for its properties in a number of media, and therefore, "because of all these efforts, we have a very aggressive marketing team." He noted that unless one is intimately familiar with the workings of the Direct Market, one is unlikely to know the difference between non-returnable sales to retailers and retailer sales to customers, and that his team had likely seen the initial sales figures from Diamond and gotten carried away. Which is fair enough, I suppose — the broken English of the text in question would seem to indicate that it was posted in some haste, and it was subsequently removed from the site. Looking for context, I asked if the marketing team was aware of the "co-op" campaign that likely paid for many of the copies of Cowboys & Aliens ordered by key retailers. "Again, that's a mischaracterization of our campaign," Altounian responded, restating his assertion that retailers weren't told what to do with the money given to them. 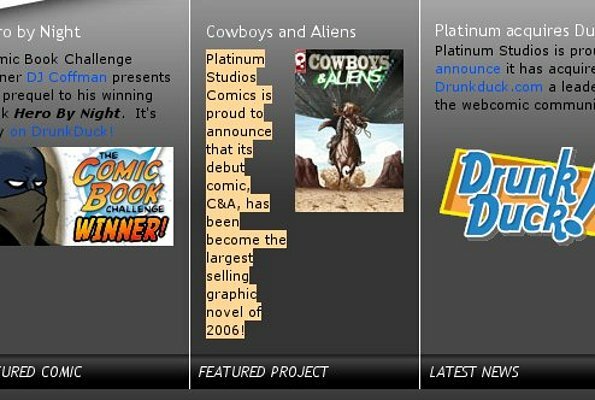 Not being a mindreader, I couldn't tell you the extent to which Altounian's description of Platinum's campaign for Cowboys & Aliens was spin. You now know as much about all this as do I. 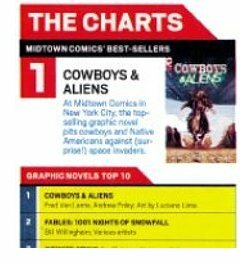 There's presently no evidence that anyone at Platinum or Midtown colluded with Entertainment Weekly to erroneously place Cowboys & Aliens at the top of a sales chart, and limited circumstantial evidence to support the notion that it was all caused by crossed wires on EW's part — if there was collusion, why was Marvel's Dark Tower giveaway likewise placed on the magazine's sales charts? Hell, the difference between how Midtown Comics describes its mutual promotional campaign with Platinum and how Brian Altounian characterizes it could just as easily be an innocent example of crossed wires, at least in theory. While I'll readily confess to being extremely suspicious of Altounian's explanation of his company's Cowboys & Aliens campaign (What idiot hands out free money to retailers with no strings attached and no expectations of specific returns? ), the fact remains that until someone in authority at Platinum stands up and proclaims the resulting "sales" to be a sign that customers have embraced their debut book, anything further I said would be a prosecution in search of a crime. For the moment, at least, Platinum has yet to do this. When and if they do, I imagine a second look will be more than warranted. Above, right: Detail from the comics sales listings found in the January 12, 2007 issue of Entertainment Weekly.